Special page layouts and publication cover designs. 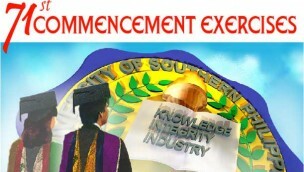 Graduation programme for the college division of the University of Southern Philippines. Advertisement section greetings page for the Diamond Jubilee Souvenir Programme of USP.